Twin Cities’ Mississippi Gorge: Urban River Rapids? 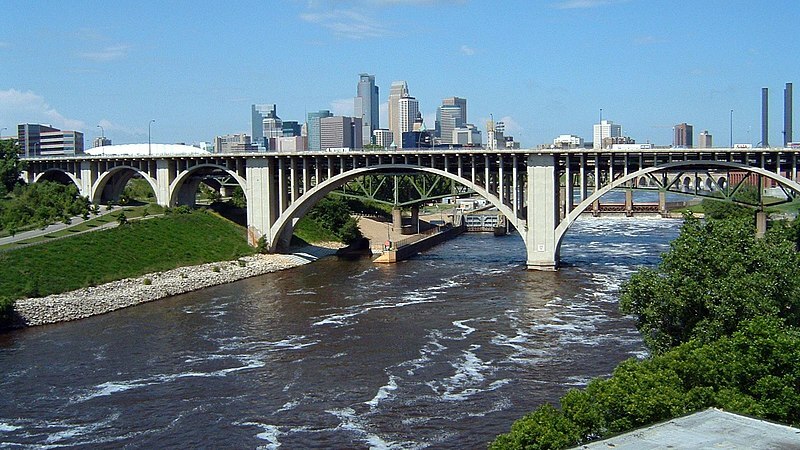 For thousands of years, the Twin Cities had a white-water rapids roaring through it, tumbling and roiling over and around enormous limestone chunks that still litter the Mississippi River’s floor for eight miles from the St. Anthony Falls dam all the way down to Ft. Snelling. If it were restored to its natural state, the “gorge” would be a kayaking and recreational wonder with hundreds of acres of new parkland, a photographer’s delight and a sportsman’s paradise. Scores of eagles would nest there, drawn by all the fish that would mass in oxygen-rich water and spawn in gravel beds under swirling eddies. And lately a small but growing band of restoration advocates see that two key events — the prospective closing of the Upper Harbor Terminal in Minneapolis and impending shutdown of the Ford Plant in St. Paul — are giving hope that the rapids may one day roar again. Only a few cities have actual rapids running through them. Dayton, Ohio talked about doing this for awhile on the Great Miami River that runs through their downtown. I don’t think anything ever came of it, but it is an interesting idea. Didn’t Denver do this? Do you know which cities have rapids running through them? Thanks! I didn’t know about the Dayton plans – that’s good to know. Denver did do something along the Platte River, but this would be bigger. There may be other plans in other places, and it would be great to know all of them.